Greater Birds-of-Paradise by A. Seba. Shown in the print is the couple of the Greater Bird-of-Paradise, ones in flight, and ones sitting down. 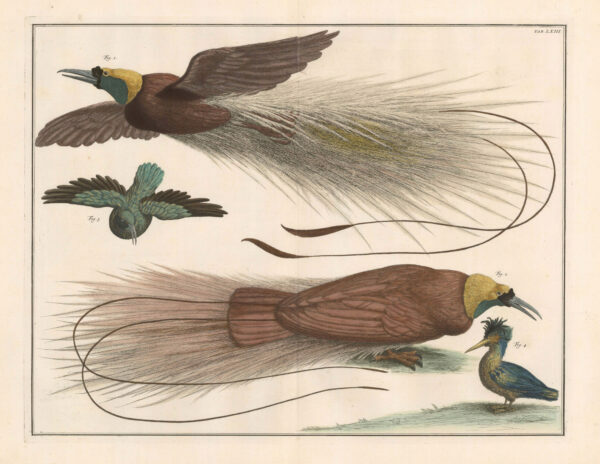 The greater bird-of-paradise is the largest member in the genus Paradisaea, with males measuring up to 43 cm (excluding the long twin tail wires). The female is smaller, at only 35 cm. Distributed to lowland and hill forests of southwest New Guinea and Aru Islands, Indonesia. A small population was introduced by Sir William Ingram in 1909-1912 to Little Tobago Island of West Indies in an attempt to save the species from extinction due to overhunting for plume trades. The introduced populations survived until at least 1966, but most likely are extinct now. Born in Etzel, Seba moved to Amsterdam as an apprentice and, around 1700, opened a pharmacy near the harbour. Seba asked sailors and ship surgeons to bring exotic plants and animal products he could use for preparing drugs. Seba also started to collect snakes, birds, insects, shells and lizards in his house. From 1711 he delivered drugs to the Russian court in Saint Petersburg and sometimes accepted fresh ginger as payment. Seba promoted his collection with the head-physician to Peter the Great, Robert Erskine (1674–1719), and in early 1716 Peter the Great bought the complete collection. However, in the following several years, Seba managed to develop another collection of natural specimens. With Seba as an intermediate, Frederik Ruysch, a well-known Amsterdam physician and anatomist, also sold his collection to the tsar. Both collections formed the core of the Kunstkammer, the first Russian public museum founded by Peter the Great in 1712. Later, in 1728, when a special museum building was designed and built, both collections, along with many other exhibits, were displayed there. In October 1728 Seba had become a Fellow of the Royal Society. In 1734, he had published a Thesaurus of animal specimens with beautiful engravings. The full name of the Thesaurus is, with a dual Latin–Dutch title, Locupletissimi rerum naturalium thesauri accurata descriptio – Naaukeurige beschryving van het schatryke kabinet der voornaamste seldzaamheden der natuur (Accurate description of the very rich thesaurus of the principal and rarest natural objects). The last two of the four volumes were published after his death (1759 and 1765). Today, the original 446-plate volume is on permanent exhibit at the Koninklijke Bibliotheek in The Hague, Netherlands. Recently, a complete example of the Thesaurus sold for US $520,000 at an auction.